EkoTek is a wireless staff protection system. The system is suitable where staff require protection onsite, such as hospitals or care homes, but also laboratories, schools, hotels, factories, shops or offices. EkoTek is ideal for those members of staff who often have to work on their own, in potentially hazardous areas or be placed in vulnerable situations when dealing with patients or customers. Not only does it give staff peace-of-mind that they will receive assistance when they need it, but help can be actioned straight away so the staff are truly protected. EkoTek is a fully battery operated mesh network based on the 802.15.4 radio standard which can be easily implemented within a building without routing wires. The combination of Ekotek and Vigimage promotes efficient and fast bi-directional communication with accurate location reporting for patients, staff and visitors. 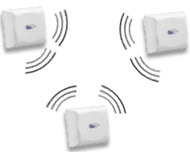 The low power radio technology developed for Ekotek automatically builds a robust wireless mesh network across the whole site, small or large. Transmitters are battery-powered and do not need any wire, making installation very quick and low cost, indoors like outdoors. The versatility of the system includes connections and reporting features for pull cords, pressure mats and other third party buttons or sensors. The combination of Ekotek and Vigimage provides essential tools to promote efficiency, quality and traceability in healthcare environments where care and safety matter. Its graphic interfaces, ease of use and processing power make it a favourite with users and managers. Vigimage with its Alarm Management platform and Data Analytics features is the true power behind the performance of Vigisense's lone worker and 100% wireless nurse call solutions. Ekotek's devices offers simple, efficient, 1-to-1 bi-directional safety event notification. Integration with Vigimage enables a truly user-friendly, organisation-wide management of the data collected by the system. It takes charge of the calls to transmit them well beyond the boundaries of the Ekotek pagers, and improves the efficiency of the response to the calls. It enhances the interaction between patient and nurse and enriches the format of the information sent to the displays, PCs, DECT phones, tablets, smartphones and other output devices. The accuracy of the notification rule module helps prevent "alarm fatigue" issues. Ergonomics and user-friendliness are back at the center of the system experience. After a thorough selection process, Vigisense has selected the Ekotek product range, manufactured by Multitone Electronics plc, as the end user devices for its solutions above. Multitone is a multinational company headquartered in the UK. Vigisense is an approved value-added reseller of Ekotek in Switzerland and across several European countries.